Need to decompose your monolithic Java EE app? Take a look at this quick introduction to Lagom, a new microservices framework. I've been heads-down in writing my next O'Reilly report and haven't had enough time to blog in a while. Time to catch up here and give you a real quick start into the new microservices framework named Lagom. It is different to what you might know from Java EE or other application frameworks. And this is both a challenge and opportunity for you to learn something new. If you can wait for a couple of more days, register to be notified when my new report will be available and learn everything about the story behind Lagom and how to get started. I will walk you through an example application and introduce the main concepts to you in more detail than I could in a blog post. This post is for the impatient that want to get started today and figure everything out themselves. Microservices are everywhere these days and more and more is unveiled about what it takes to build a complex distributed system with the existing middleware stacks. And there are far better alternatives and concepts to implement an application as a microservices-based architecture. The core concepts of reactive microservices have been introduced by Jonas Bonér in his report Reactive Microservices Architecture which is available for free after registration. Lagom is the implementation of the described concepts. It uses technologies that you might have heard about but probably rarely used before as a Java EE developer: mainly Akka and Play. But for now, let's just forget about them because Lagom provides you with a great abstraction on top and gives you everything you need to get started. Have activator and Java 8 installed. Activator is something that you may not have heard about. It is built on top of sbt and helps you getting started with your projects and much more. A Lagom system is typically made up of a set of sbt builds, each build providing multiple services. The easiest way to get started with a new Lagom system is to create a new project using the Lagom Activator template. No need for anything else right now. You probably want to have an IDE installed. 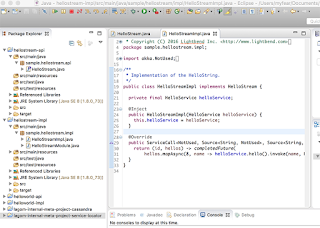 IntelliJ or Eclipse should be good for now. Change into the newly generated folder "first-lagom" and issue the sbt command to create an eclipse project. A bunch of dependencies are downloaded, and after the successful execution you can open Eclipse and use the Import Wizard to import Existing Projects into your Workspace. Note, that if you are using the Immutables library with Eclipse, you need to set this up, too. Now go and try out your first service by visiting http://localhost:9000/api/hello/World. Now you're all set for the next blog posts, where I am going to walk you through the example in more detail. If you can't wait, go ahead and read the Lagom Getting Started guide.